I remember when plastic bags showed up at the fruit and vegetable shop. 'I dunno where these shop owners think this is all going to end. They give you a plastic bag for an apple, a plastic bag for a piece of broccoli. These plastic bags are all gonna end up in the ocean and rivers and as landfill. it’s crazy!' said a friend. She was younger than me, perhaps 18 to my 20, and prescient. Plastic bags -- like all the rest of us, I was intoxicated by the convenience of it all. My friend sounded like some kind of bitter extremist. Even if I knew she was right, she was spoiling the fun. You didn’t have to plan to shop by bringing a bag anymore. You could pop into a store for a bottle of milk and end up with four or six bags of shopping because of these useful plastic bags. No wonder the shop owners liked them. I also remember when deli items — olives, dips, baby mozzarella — started showing up in plastic containers, like irresistible gifts, just for you. The first time I saw that was in New York. I thought, ‘Okay — you can do this? So it’s okay to make this nice looking plastic container and take it home? And I don’t have to queue up or interact with a person behind the deli-counter anymore. I never was really on top of what you're supposed to say to them’. I had convenience and avoidance of social learning. Other people must've liked that too, because now thirty-five years later, you can barely buy a tomato without a plastic tray. 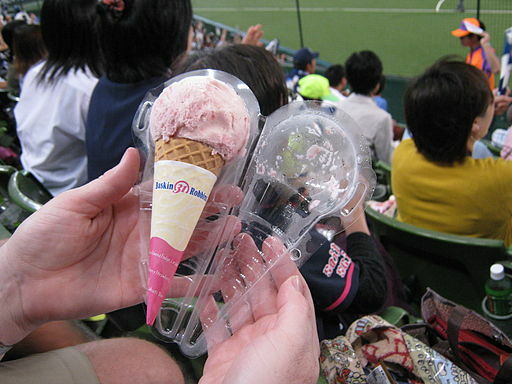 Ice-cream packaged as a treat on a big day out at the game. Photo by ElCapitanBSC. Back then, it wasn’t long before bottles of milk disappeared and you could only buy it in cartons. So much the better — no more washing up the bottle and having to return it. And because you didn’t return the bottle, you were less likely to have a relationship with a particular shop anymore. I wasn’t the only one who found freedom in the anonymity of the supermarket. I was an insecure teenager, becoming afraid of other people's judgments, just like everybody else. Watching the corner stores and milkbars die was painful. Kids used to go there to worship lollies. Hanging around there with a milkshake or a smoke was an adolescent rite of passage. There was also a forced exposure to other people, some of them aged, disabled or lonely--sharing a counter with you in a small space that smelled of syrup and tobacco. Getting out of those little shops and into the spacious supermarket aisles put an end to that. How our fears and insecurities around other people have been magnified and exploited by marketers! People buy cars, partly to avoid the challenged personal boundaries on underfunded public transport (which is, in turn, underfunded to encourage people to buy cars). We buy plastic containers because we have come to believe that the world of work is so much more important than giving energy and planning to our food at home—and so a planet goes to ruin. In Werner Herzog’s classic and hilarious film Where the Green Ants Dream there is a scene when the mine geologist, played as a horribly awkward bloke by Bruce Spence, goes to the local supermarket. It’s one of those middle-sized modular chain stores, transplanted into the South Australian desert. There’s a group of the film’s Aboriginal people (actual actors from far-away Arnhem Land) congregated in the supermarket. They sit on the floor in a rough circle across the biscuit aisle. ‘What are they doing there?’ asks Spence’s character. ‘They come all the time,’ replies the store manager. ‘They reckon there was a sacred tree there and they still come to sit around where the tree used be.’ I’ve experienced this in real life — Indigenous people seeking the vibration and knowledge of a place under a layer of concrete or plastic. Scaring the bulldozers. 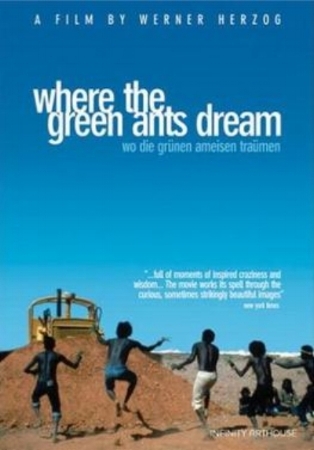 The video cover of Herzog and Ellis' 1984 film. Wikimedia photo. I thought of some of these things yesterday when I bought a coffee. I was obliged to travel with the coffee and appreciated the convenience of the take-away container, but I was unable to put the white plastic lid on top of the cup without imaging it piled up in a mountain of rubbish on a beach, good for another twenty years of uselessness. I’ve been on an island in the Indian Ocean when the exquisite beauty of one part of the atoll is shockingly violated by a mountain of plastic that builds up out of the tide daily. A pile of plastic over a metre high, containing plastic bottles, coffee cup lids, straws, plastic dishes for selling and carrying fruit and veggies, shampoo bottles, medicine bottles—all the detritus of convenience and a kind of glamour. I would still see an especially pretty bottle or medicine packet and feel attracted. The glamour is still not broken. I have cosmetics in lovely jars. When you buy them (or receive them as gifts) it feels like they will last forever. When you get to the end of the bottle or jar it feels like there should be something more I can do with this. A few of them find uses. The rest clutter the house until I accept that they need to be somewhere else and put them in the garbage or take them for recycling. Not far from where we live there is a recycling hub, where you can take some of these things. There is even a place to put the drink containers with their plastic ring pulls and lids. Claudia saw on television that the workers there said, ‘We appreciate it when you rinse out the bottles and the milk and juice containers, so that our job is cleaner.’ That reassured me somewhat. It means that they are doing something with these things when we move them from our place to theirs. But there’s still nothing useful to do with these giant plastic yoghurt containers with the lovely swinging plastic handles. How many of these have to accumulate before someone nearby starts selling yogurt into a jar we bring to them? Claudia’s mum remembers going to a central dairy in the village to get milk, cream and butter in their own jugs and jars. The village had a central bakery then, too. People brought their dough to the huge wood-fired oven and socialised while the bread baked. Wood-fired oven -- every village should have one. Pic by tcameliastoian. So sensible packaging is not so far from the times and places we inhabit. When I was a child the milk was delivered very early in the morning to our doorstep. There was the challenge of keeping cheeky magpies from piercing the glinting foil bottle caps and drinking the cream. But it was a good system. We have a similar system for bottled water here in the village. The drinks man comes on Saturdays, not too early, I’m grateful to say, and brings a crate or two of bottled water. It is bottled at source in the mountains around here and the bottles are picked up again, washed and reused. In our parents’ time, many goods came to the home. An Aboriginal colleague in South Australia told me how he worked as a rabbitoh as a kid. He and a companion hunted rabbits and sold them door to door. There were rabbitohs in New South Wales where my parents grew up, too. And even in my childhood, the baker brought bread every day (and custard tarts or cream buns if you asked for them). In the 1950's mass production blossomed. The idea of selling an oven to each house; a washing machine (and iron and ironing board) to each house; a whole lot of appliances to do work once done outdoors or out of the home and often shared: all this production and selling meant that work which might have been done socially was now done by women at home alone. In creating mass-markets, merchandisers sold convenience. More individual autonomy and loneliness came with it. This is happening in the so-called developing world now. Instead of coming out to watch the village television together, people have a television in their own home. Instead of going to the house where the washing machine is, or down to the river, people have their own machines. people watching television together. Talking to them is Brij Kothari, who increased literacy by inventing same-language subtitles on TV. Wikimedia pic. Meanwhile, in 2018, there was a clever ad campaign for little plastic capsules that you throw in the washing machine. Green and blue, they are as intriguing as jewels in the photographs. The ad showed groovy young people dancing around their washing machines in celebration. These gems of lavation come in a hard plastic box. When you wash the clothes with them, you get a wadge of plastic in the machine afterwards. Or, if you use a higher temperature the plastic 'disappears'. That means it becomes another mess of the microscopic plastic in our waterways. Did you hear that sea salt has plastic in it now? We live in a society subject to mass confusion between having things and being someone. Of course, this confusion serves the interests of those who would like to sell us things. Millions of dollars are spent convincing us that those objects are the key to being someone or something desirable. And all those things we have, have to go somewhere to make way for other things we need to have. It’s a tangle. I owe an apology to my friend the Cassandra all those years ago. And I’ll take my bamboo cup to the coffee cart this afternoon. Thumbnail image of a laundry detergent capsule. Thank you Soulbust at Wikimedia.